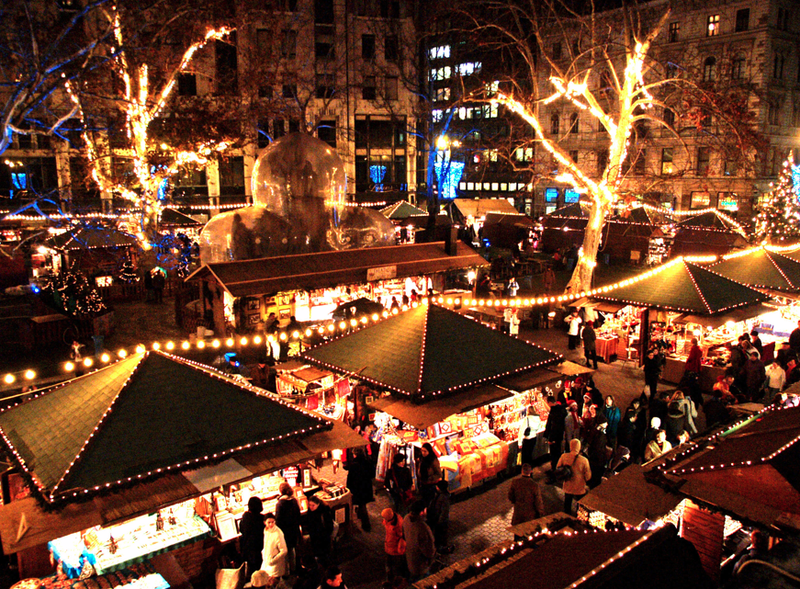 Christmas Markets are all over Budapest, and even though the most visited is the Christmas market on Vorosmarty Square (the oldest fair), there are multiple venues to see some more Budapest Christmas markets. We encourage you to take a look at more of them, such as the Xmas at the Basilica, or the fair on the courtyard of Vajdahunyad Castle, etc., and the Christmas fair on Budapest Erzsebet Ter (Elisabeth Square). 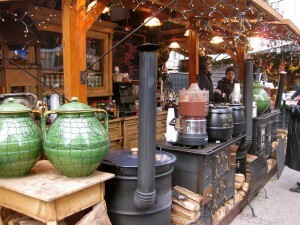 The name of the fair in 2012 is Karacsonyi Zsivaj (Christmas Racket). There will be many retro things as well as fire jugglers, concerts, and more. 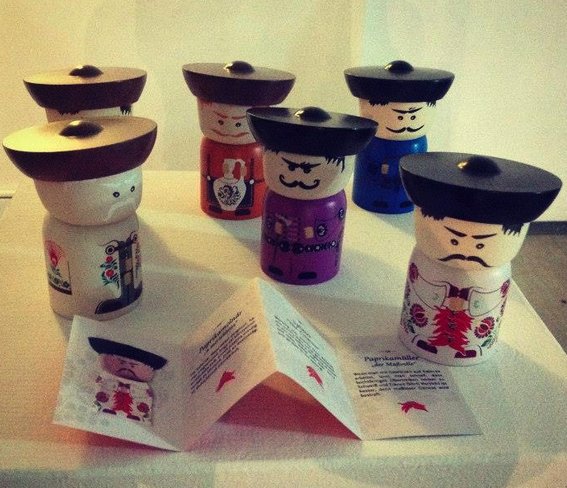 You can take a look at the many goods made by Hungarian toy makers, crafts of Hungarian designers, etc. The Christmas Market on Vorosmarty Square is often thought of as the single Christmas market in the city of Budapest, which luckily is not true. 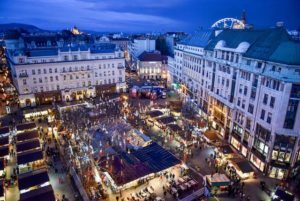 However, what is true is that the Xmas fair on Vörösmarty Square is the oldest, richest and the most spectacular of all the Christmas markets in Budapest. 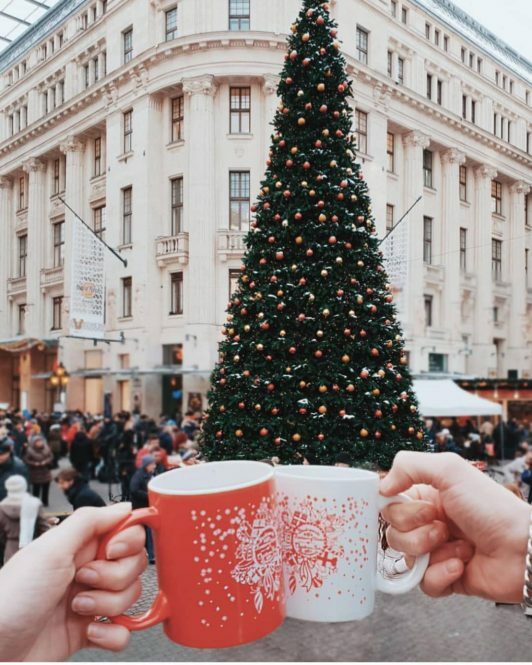 the Crafts Market of the Budapest Christmas Market is open between Nov 9 and Dec 29, 2018. After that, only the Food stalls will remain open until January 1, 2019. 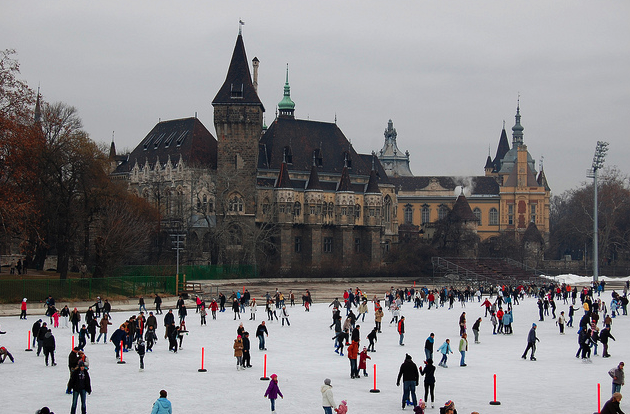 When is the Christmas Market on Vorosmarty Square, Budapest? 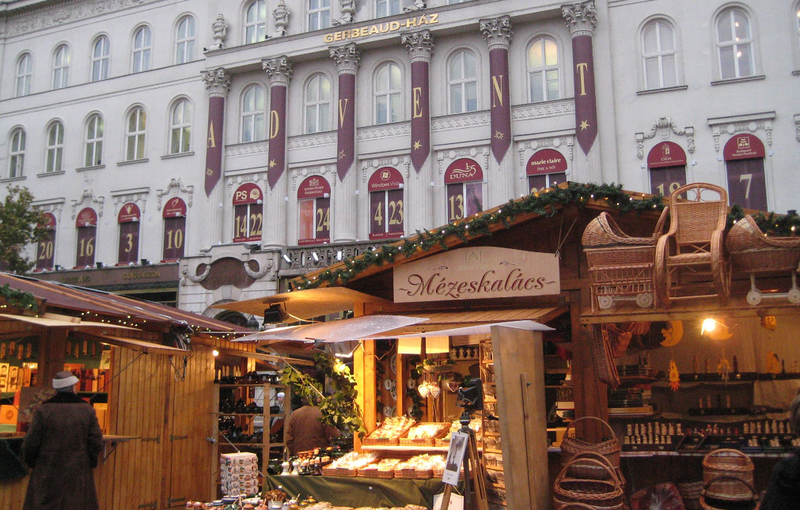 The Christmas Market on Vorosmarty Square takes place each year in November and December. The handmade gift stalls are only open until Dec 24, Christmas Eve until 2pm. 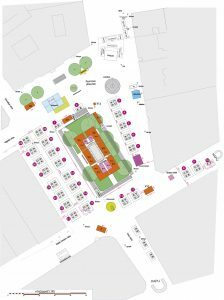 From Dec 29, only the gastro stalls remain open, the folk art and design stalls are only open until December 29. On Sundays at 4 pm: lightning the Advent Candle on the man sized Christmas Wreath, followed by Angelic Choir Songs. Where is the Vorosmarty Square Christmas Market in Budapest? 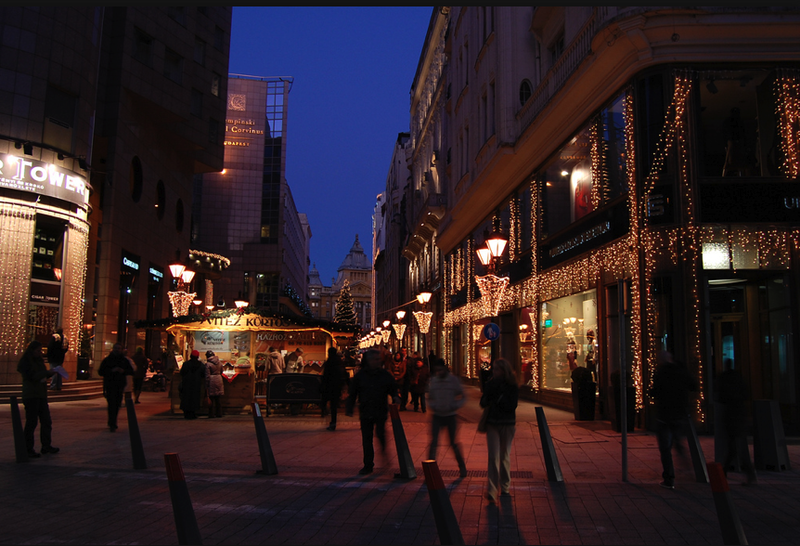 Downtown, the Christmas market is in the best possible location in Budapest, in the heart of the city. The nice square is called Vorosmarty square, i.e. Vörösmarty tér in Hungarian. 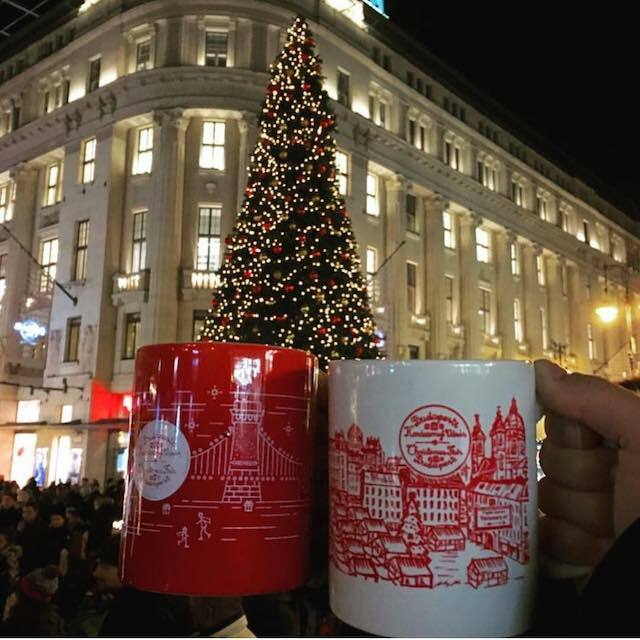 What is the Christmas Market on Vorosmarty Square like? 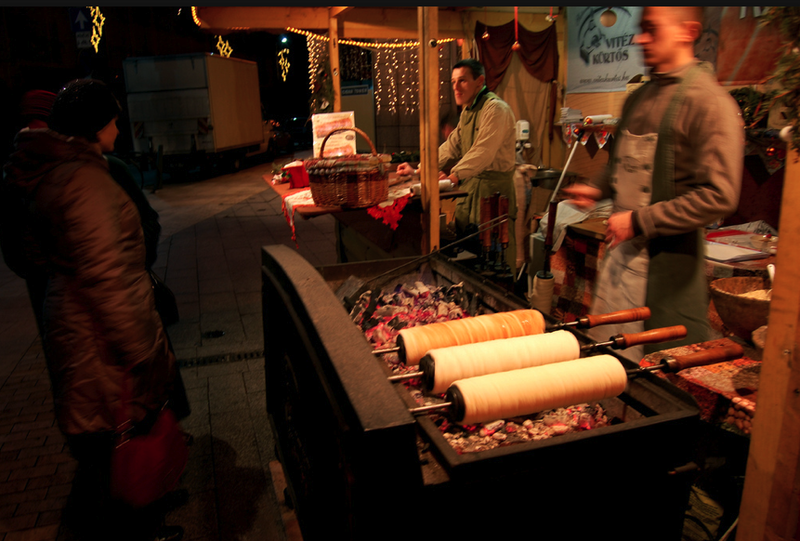 First and foremost, the Christmas market on Vorosmarty ter is a delightful sensory experience: full of colours, festive sounds, and enticing smells. Like an old picture postcard from your grandmother’s age, when street foods and choirs singing were so natural. The festive market stalls are ready to open in mid November, and the square turns into an old folk tale with its dozens of buzzing wooden market stalls, the concert stage, thousands of handmade gifts, the lovely smell of cinnamon pastries (Kurtoskalacs – Chimney Cake), sausages, mulled wine, grilled vegetables, street snacks like Langos, dodolle (potato dumplings), etc. The lights of the Xmas market are not the dazzling commercial mall lights, and you will not see hugely sized Santa Clauses either. The lights and decors are more toned down, which makes the fair sort of nostalgic. 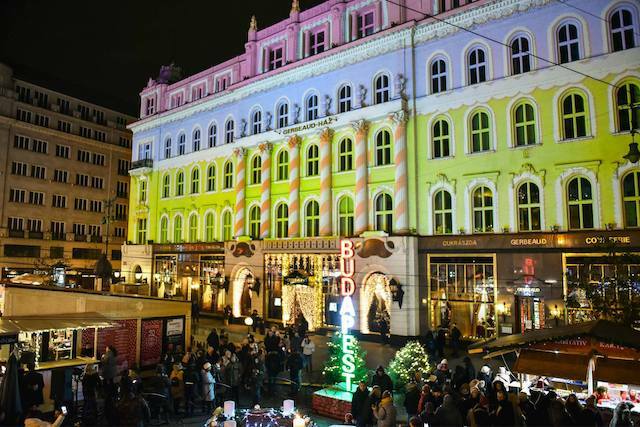 The nostalgia Christmas fair of Budapest will be both complemented and contrasted by the surrounding buildings on Vorosmarty square: while most buildings date back to the 19th century, like the popular Cafe Gerbeaud, there are also newer buildings. 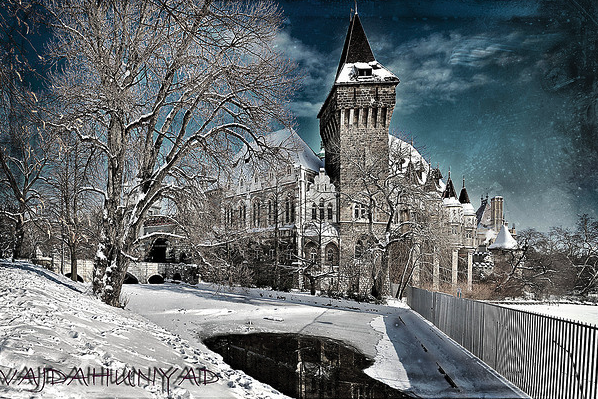 And what is new always reminds us that we are just visitors on a fairy tale Christmas island. 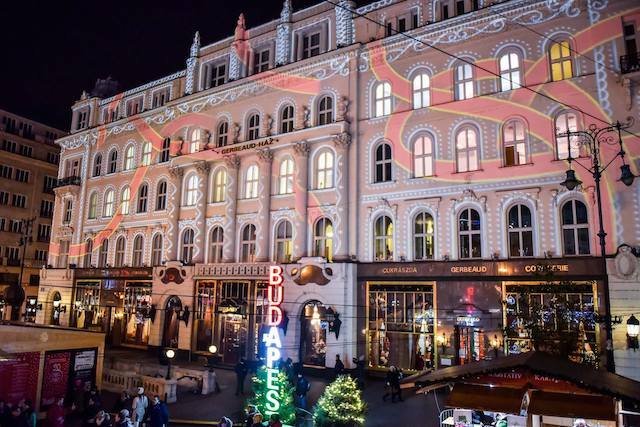 In the evenings, there will be festive light painting shows on Cafe Gerbeaud. 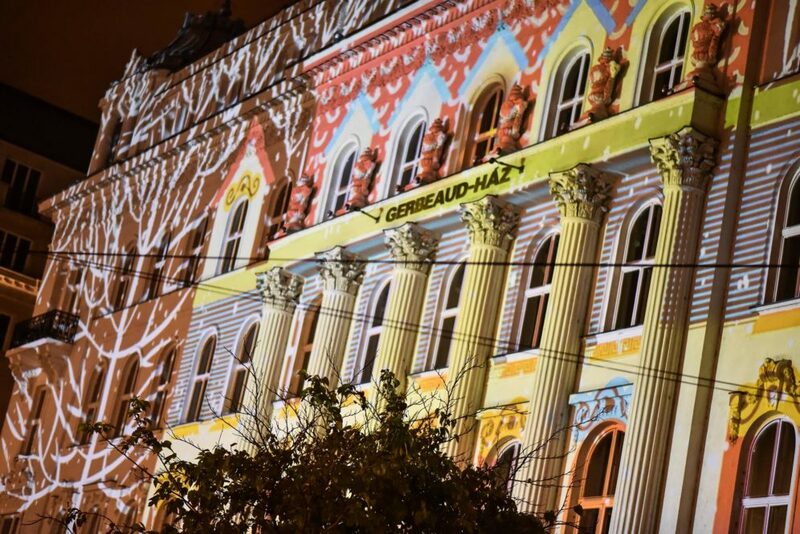 The Christmas light painting on the facade of Cafe Gerbeaud is enchanting, puts you right into the middle of the Christmas story. 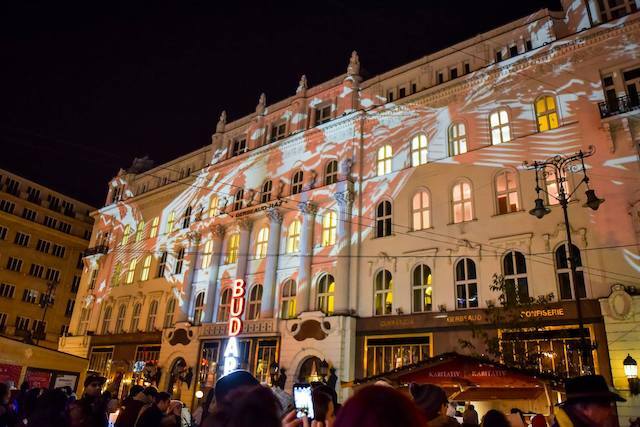 In some years, Cafe Gerbeaud had a huge Advent calendar on its facade, but in the last few years, the concept has changed, favouring the laser ray painting. There are many free entertainments at the market, several concerts late afternoon, even on weekdays. Concerts are in a wide range of music genres: folk, jazz, crossover, indie, blues, soul and world music. How do you say Vörösmarty tér in Hungarian? The pronunciation of the Christmas square may seem too difficult at first time, but saying it 2-3 times out loud will make it super easy. 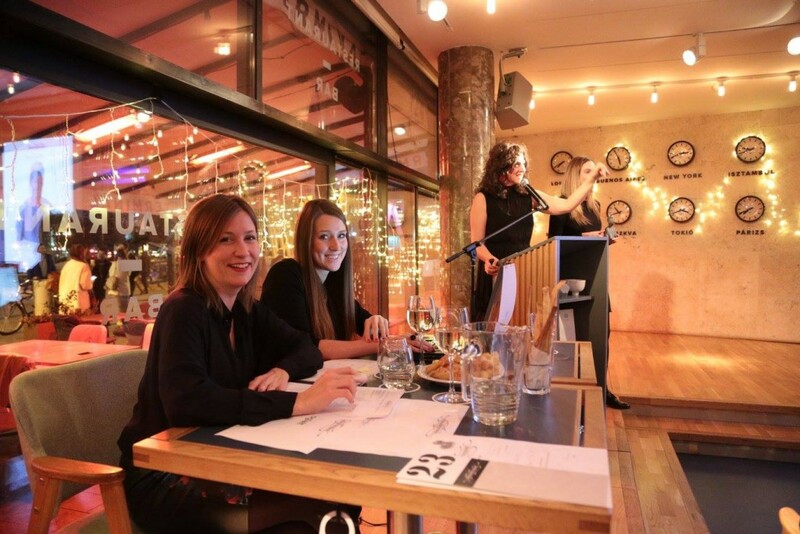 Say: verr-ersh-mor-ty tay-r) Ö in Hungarian is always pronounced as the ‘ir’ in girl or Shirley, while É with an accent, is always pronounced as -ay- as in ray, say, but we do not say the ‘y’.